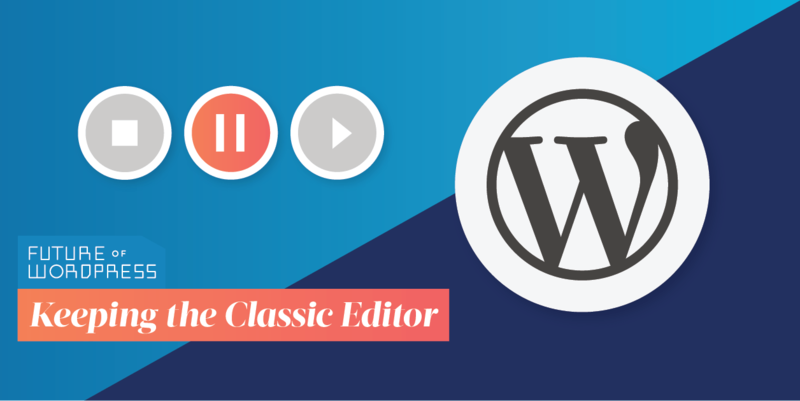 With the release of WordPress 5.0 and the new Gutenberg block editor right around the corner, many people have asked: If I’m not ready, how can I keep the classic editor on my WordPress site? Not familiar with the block editor yet? Snag our free Guide to Gutenberg ebook! Lucky for you, it’s easy to disable Gutenberg until you’re ready for it and keep the classic editor on your WordPress site. You can disable the block editor entirely or selectively phase it in—the choice is entirely yours. First Things First: Make a Backup! We can’t stress this enough. If you don’t have a complete backup of your site and database, go make one now. While the odds of anything going awry when updating to WordPress 5.0 are pretty low, it’s still possible something could break on your site. Trust us—if something does go wrong, you’ll be so glad you took the extra couple of minutes to make a good backup. If you’ve never done this before, take a second to learn how to create a site backup. We also recommend testing updates on a staging site before pushing them to your live site. If you don’t already have one, you can use our staging site setup guide to get started. If you’re not ready for the block editor when WordPress 5.0 arrives, you can install the Classic Editor plugin (developed by core WordPress contributors) to keep using the classic editor until you feel comfortable switching over. At the time of writing, the core Gutenberg development team is considering whether or not the Classic Editor plugin should be included by default with WordPress 5.0 update. For the latest updates, head over to our All Things Gutenberg resource page. Adapting your site to the new Gutenberg block editor doesn’t have to be all or nothing. The folks at Automattic, the team behind WordPress.com and WordPress VIP, have created a helpful tool called the Gutenberg Ramp plugin. With this plugin, you can activate the WordPress block editor selectively across your site—for example, you can choose to activate the block editor only on specific post types (such as events). The core WordPress team has confirmed the Classic Editor plugin will be officially supported until December 31, 2021, and we expect the Gutenberg Ramp plugin will follow a similar timeline. While you can certainly stick with the classic editor for as long as you need, you won’t want to wait too long to make the switch. New, exciting features are already being developed around the block editor—the sooner you make the transition, the sooner you’ll be able to put those features to work on your site. Embracing the Gutenberg block editor can seem intimidating at first, but remember, you don’t have to tackle it all at once. Armed with a smart plan for your site and helpful resources like the ones on our All Things Gutenberg page, you’ll be able to gracefully navigate the changes at your own pace. Get the latest Gutenberg info and other news from The Events Calendar delivered straight to your inbox.